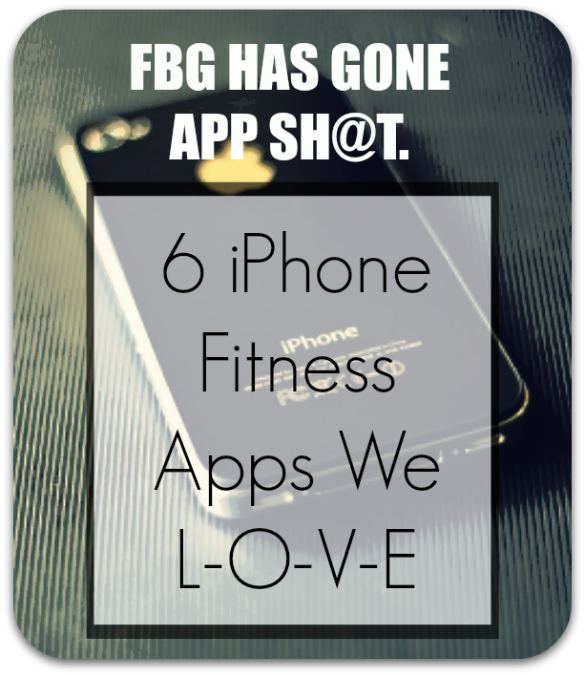 Trying iPhone Fitness Apps: We’ve Gone App-sh@t! Yep, I’m one of those people. I’m an iPhone junkie and proud of it. I named my iPhone “Poppins” because she magically organizes me. I say good morning and goodnight to my iPhone. Basically, Poppins is glued to my hand. So it was only a matter of time before my Fit Bottomed Girl-ness found its way into my phone’s heart. Like all health and fitness iPhone apps, there are some good ones and some really pointless ones. (Does anyone really need a “mustache me” app? I think not.) So to help alleviate the mindless searching (and loss of phone space), I tried out a couple. 1. Nike + GPS: This is my favorite iPhone fitness app, hands down! I first learned of the Nike app when I was at a Nike Chicago event. The Nike Team was nice enough to loan the group iPhones so that we could see just how snazzy the new app really was. I ran a couple of miles that day and fell in love. Not only does it track your miles, calories burned and pace, but it also allows you to virtually connect with other runners. Want a challenge? Feel like picking up the pace? Want to push yourself an extra half mile this week? Need some encouragement? This iPhone fitness app allows you to designate a power song that you can summon whenever you need it. My current motivational song is “Sugarfoot” by Black Joe Lewis & the Honeybears. We shall try all of them. I have the Nike + GPS and it’s every runner’s dream. Thank you Tish! You really need to try “Get Running”. It’s a GREAT C25K app that works with your iTunes. I have tried several and this is seriously the. best. one. I have been using My Fitness Pal for over a year now as my diet/exercise journal. I have lost 30 pounds!!! Definitely my favorite app! I really like Nike’s free app Nike Training Center. Tons of great routines that allow me to pick my workout based on my goal (cardio, strength, toning) for the day and what body parts I want to work on. Plus, you unlock special workouts based on how many minutes you workout with the app. Have you seen Fleetly yet? We’ve created a fun site/iphone app/community where you can track your fitness, create and share workouts, compete against friends, or yourself, in challenges. We even take all your exercise into account to give you a single Fitness Level number that makes it super easy to track your progress and keep you motivated (it starts to drop when you’ve been sitting on the couch for too long). I also wanted to say thank you. I write a weekly blog post on Fleetly that highlights exercise related articles from around the web and I often check the FBG’s blog. @Julie I checked out the “Get Running” App you mentioned. It looks totally awesome! Thanks for the suggestion! I really like Daily Burn Tracker. It tracks nutrition and workouts and even sends email reminders when you forget to track your nutrition!! Nike Training Club!!! Free with a ton of quality free workouts. I love it!